Major Victory as Russia Bans Trade in Harp Seal Skins! I'm thrilled to tell you that the door to one of the largest markets for seal products has now been slammed shut - the Customs Union of Belarus, Kazakhstan, and the Russian Federation has banned the the import and export of harp seal skins. Woo-Hoo!! Now maybe Canada will follow suit!! This is huge news, and should be given greater exposure. Thank you Barbcat for posting! Although,I imagine there is always a black market, this is wonderful. Having the officials of an entire nation say NO More is a powerful statement. Let this hideous archaic industry die! Thanks for the good news. If there is no demand, the atrocities will stop...but as Constance, there will always be a black market. This is terrific news. In hopes others will follow. About time. Now the rest of the world needs to follow!! Thanks Barb. Great news, Barb. Thank you for sending. Now that this great event took place, they need to crack down on third-world black marketing. Thanks Barb for the update with great news. I love this good news, thanks Barb!!! YAHHHHHHOOOOOOIIIIIIEEEEEEEEE!!!!! This is sooooo awesome!!!! Here in Canada we've been battling this sickening slaughter for soooooo long. Now with 90% of their business gone maybe NOW it will be stopped once and for all! HAAAAAAPPPPPY DANNNNNCE!!!! Cha cha cha!!!!!! Thanks Barb!!!!!! Yip yip yippppeeeee!!! Very good news to here...I hope they honor, their word...Thanks Barb!!! Wonderful news ! Hopefully, other countries will follow with the same. thank you for the great news BarbCat!!!! will forward!! Great news, way to go Russia!!!! Finally some really good news, not only for all of us, but mostly for the seals!! Noted! Fantastic!!!!!!!! Who could have believed that should happen! One of the greatest Christmas presents ever! Thanks for posting this wonerful article! I'm really proud of country! It's a great step! Noted! Excellent! Thanks for sharing this outstanding news! (Dewin' my happy chair dance here!!) Go Russia, go Russia, go Russia!!!!! I am just too elated for words. 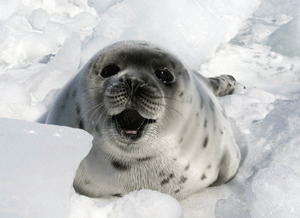 I am soooooooooo HAPPY for the Seals!!!!!!!!!!! With Russia telling them (mainly Canada) NO WAY to seal fur, Canada hopefully will be forced to shut down that disgusting, barbaric industry. Burn the Hack-a-pics!!!!!!! Great Christmas present! Thanks so much for posting this, Barb!!! A very good news indeed. Really good news. Thank you BarbCat. Now lets focus on Canada with its appalling seal hunt. Hooray!! thank you God and thank you Russia for saying no more seal skins!! Fantastic news great artical..thanks Barb! I can't even say how thrilled I am to hear this great news. Canada take note!! Canada you should be ashamed of yourself. Thank you so Much for sharing this, Barb ! like the good news, making me smile all over the place today Barb and Lisa! I can only pray Barb, that Canada will come to their senses as the majority of Canadian have opposed this blood bath cruelty for decades. It is the Freaking Prime Minister Steven Harp er that is continuing to allow this insanity! Like the US Harper is an Illuminati puppet, the people truly have no voice, they do what they freaken want too. Prime Minister Vladimir Putin is right in calling it a bloody industry! All lives have a right to live here. Refreshing: good news in the world of humans living in their delusional alternate universe bent on depravity and destruction of the mother and all of her children. Today I heard the good news. Comfortable leaving my poor dolls killers. God I love you so much. IFAW Thank you. BarbCat Thank you. I was very happy this news. I am sending thousands of kisses. Noted. Thank you for posting the great news, Barb, and thank you for forwarding, Lisa. If we keep this up, we're just likely to save our planet. Thanks for sharing this wonderful news. I hope that now without the market, Canada will finally stop seal hunting for good. It has been long overdue for this already. Fabulous news!!! It is time to stop in whole world seal hunting. Thank you BarbCat and all my friends who forwarded this news. Noted. Yes, a major victory! A step in the right direction for ecosystems. Thank You, BarbCat. This is wonderful news...look how happy the seal in the photograph is!!! Thank you so much. That' s good news. Thank you BarbCat for sharing. Noted. Thanks, BarbCat, for sharing this wonderful news. Thank you to Gerald for the added information, isn't it terrible that the majority of their citizens are against the slaughter as well as the fact that the hunt is not turning profit. So, yes it will be interesting to see how this all unfolds. Still, I can't help but feel that it is a positive! WE NOW NEED C-A-N-A-D-A TO DO THE SAME!!! WONDERFUL wonderful news. No let's encourage Canada. Thank you for the good news. This is GREAT! Honestly though, what took them so long. How could you look at those little faces and want to hurt them. Now it's Canada's turn! love making possible for the blind to see. YAAAAAAAAAAAAAAAAAAAAAAAAAAAAAAAAAAAAAAAAAAAAAAAAAAAAAAAAAAY! This is the best news I have heard in awhile. Hopefully if more sales declined, those stupid, pathetic sealers will have to abandon clubbing poor baby seals all together! One can only hope! WHAT WONDEERFUL NEWS, certainly a Christmas Miracle. THANK you to everyone who worked so hard for so many years to come to his point where Canada will have NO CHOICE BUT TO STOP THE SLAUGHTERS! YEA!!!!!!!!! !AND WE ALL HELPED!!!!! Great and amazing news! Thanks Barb! Loooong overdue... It's time to step up and take back our world!! To protect it for our future! This is great news! Now if we can get Canada to stop this horrid practice! Great news! Thank you Barb!